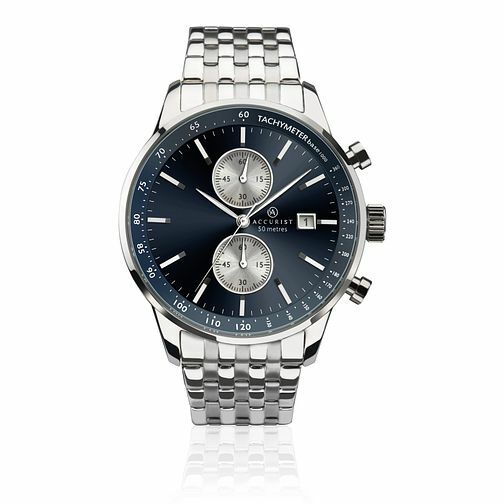 This Accurist men's stainless steel watch packs all the punches when it comes to both style and practicality. With a date window positioned at the 3 o'clock mark, the blue sunray is completed with the silver-tone detailings. Made from robust stainless steel, this watch is made to last, also boasting water resistancy up to 50 metres. Accurist Men's Chronograph Stainless Steel Bracelet Watch is rated 5.0 out of 5 by 1. Rated 5 out of 5 by Anonymous from This product looks great The product was well-packaged & it wasn’t damages since I got it delivered to collect at a store. They also showed me the watch before giving it to me. The only thing that would have knocked my review down was that the date on the watch is the wrong date but that’s easily fixable.